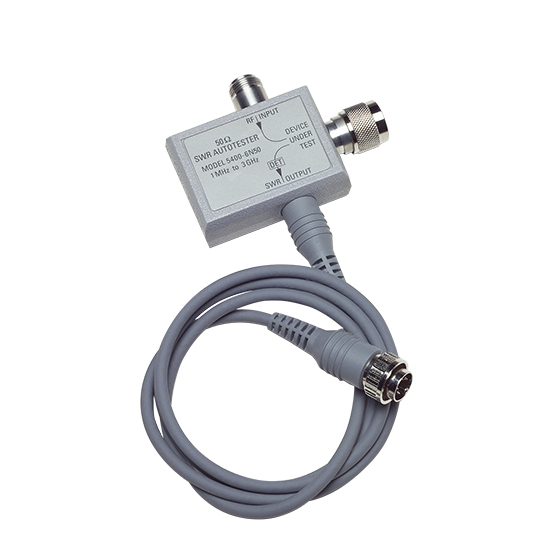 The 5400-6 Series SWR Autotesters integrate a high directivity bridge, a detector, a low reflection test port, a precision reference termination, and a connecting cable. They are used with the Model 56100A Scalar Network Analyzers and with Series 54100A Scalar Measurement Systems for making fixed-frequency and swept-frequency return loss (SWR) measurements. Return loss measurements are used over a wide range of radio and microwave frequencies to check the performance of systems, subsystems, and microwave components such as amplifiers, directional couplers, attenuators, filters, splitters, and terminations. 1 Where p is the reflection coefficient being measure. Accuracy includes the effects of test port reflections and directivity.